Pakistan continued to dominate with the bat, before a flurry of wickets gave England a smidgeon of hope. 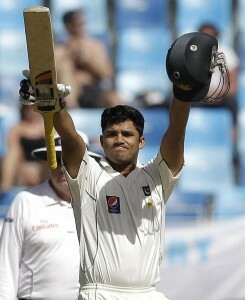 Only really one candidate for player of the day: Azhar Ali. Yesterday he was somewhat overshadowed by Younis Khan, but after his partner was dismissed for 127, Ali continued to play terrifically well. He was circumspect and solid, but played the occasional sumptuous shot. By the time he was out he had helped move the score to 363/9, of which his contribution was 157 from 533 minutes and 442 balls. It is probably more than enough to secure the series whitewash. For much of the day, the bowlers toiled with little success. This was the kind of score that many had expected to characterise the entire series, so any complaints about the bowling should be torn up. As the day progressed, the spinners found more turn and bounce, which helped Monty Panesar pick up four quick wickets. His figures of 5-124 from 56.4 overs reflect very well on his performance; indeed he out-bowled Graeme Swann who only picked up his three wickets late on. Chasing, (we use the word loosely), a target of 324, England’s openers batted adequately. They offered only a few half-chances and reached 36/0 at stumps. Pakistan would be strong favourites if only due to the prior performances of the England batsmen this series, let alone because of their handsome lead. England must build partnerships, but we fear that once again the spinners will pick up regular wickets. The way that Pakistan have turned this match around has been mightily impressive, and we believe they deserve the victory that we predict will happen sometime after tea tomorrow.